For an effortless and professional way to apply liquid and/or powder foundations, try using WEDGES COSMETIC Latex-Free Disposable sponges. The wedge itself has a thin, smooth contoured end that allows you to apply your makeup perfectly underneath the eyelid and between the eyebrows. Once you have applied your makeup with the wedge disposable sponge, on that same side, dampen it with cool water to set your makeup. Don’t throw it away just yet; use the other side the very next morning. 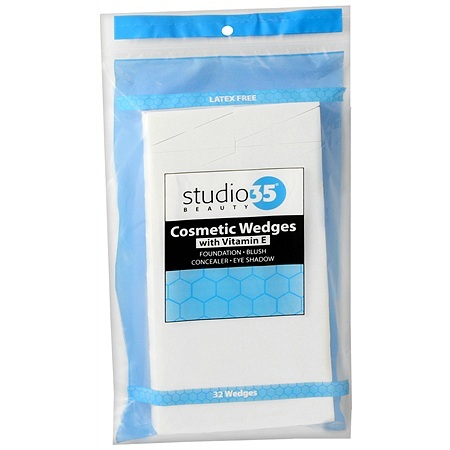 The wedges come in a pack of 32, but by using the other side, it lasts twice as long. They can be found in just about all drug stores. If you have sensitive skin and need to be careful of the products you use, this is the way to go. I had to toss my facial brushes because they were breaking me out. P.S. It is also great in applying eye shadow and concealer. This particular image is from Walgreens.